There has never been a chapel or even a church in Ny-Ålesund. This little belltower was built in 1951 by the women’s society „Polarklokken“ (polar bell). 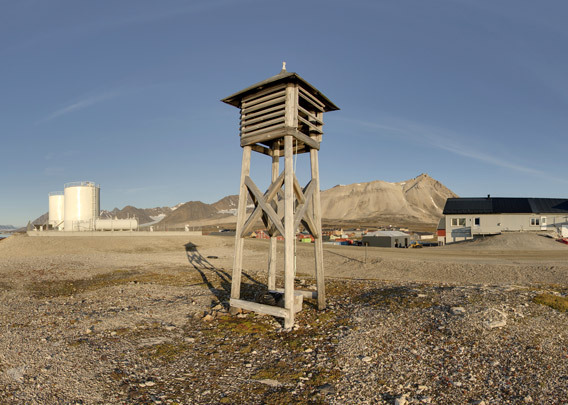 They actually aimed at collecting money to have a chapel built, but they did not get that far before Ny-Ålesund as a mining settlement was abandoned after the large mine accident in 1962. The belltower is a relict from that now rather distant chapter of Ny-Ålesund’s history when the place was about to become a “normal” village where families with children lived. They tried to establish a “normal” life here as much as they could. The attempts to get a chapel were part of this development. The view over Kongsfjorden is excellent from the belltower!